Question: Can I choose who to have eService notification sent to by case? For example, on different cases I want to have different people be notified of eServices I receive for those cases. Answer: Yes, FileTime enables you to customize the eService notification list for each of your cases. Click eService Notifications on the drop-down menu (Figure 1, C). To add a recipient, click the +Add eService Notification button (Figure 1, D). The Attach Firm Users to this eService Notification page opens (Figure 2). If the individual you want to add is not found on this list, click the Add eService Notification option (Figure 2, C) and add that person to the list. When done, click the Save and Close button (D). You are returned to the Notification Preferences page with the new recipient(s) added to the list. 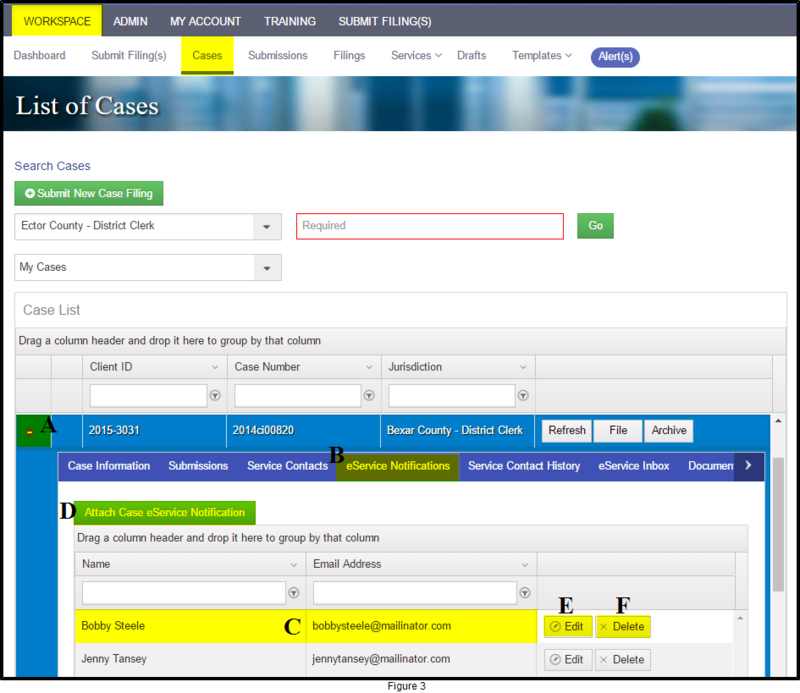 This method is also exclusive to FileTime and it enables you to customize the eService notifications list to your legal assistants for each case. From the Workspace tab go to the Cases page (Figure 3). Find the case on this page and click the + sign in the far left column so it becomes a - sign (Figure 3, A). 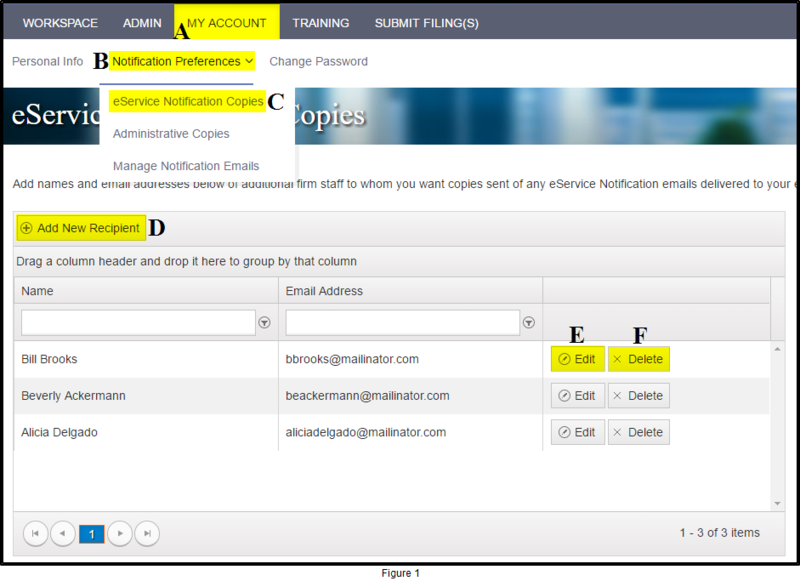 The case tabs open below the case - click the eService Notifications tab (Figure 3, B). FileTime will, by default, send notifications to any additional recipients you added using Method 2 above. However, if you have added any names on this eService Notifications tab (Figure 3, C), FileTime will override those default names and send the eService notification email copies ONLY to the names on this list. 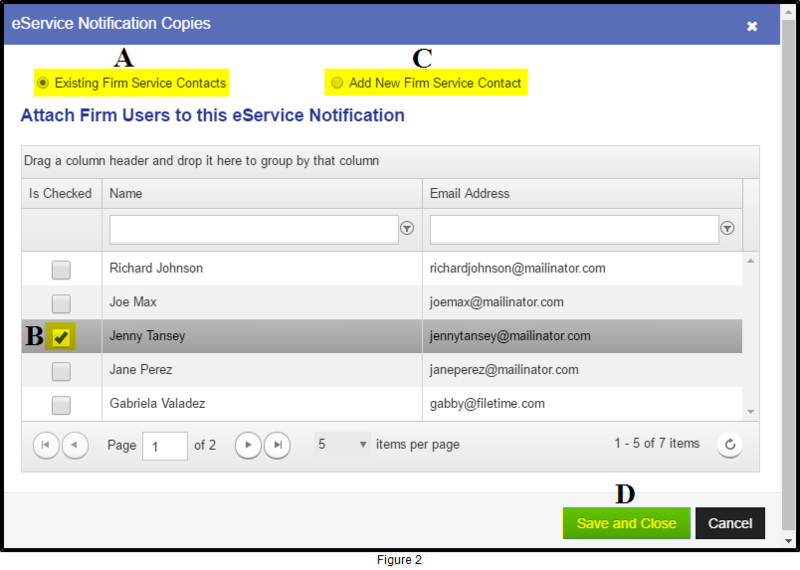 Click the Attach Case eService Contacts button (Figure 3, D) to distribute copies of eService notifications emails to additional firm members for this case. Click the Edit button (Figure 3, E) to revise information about that recipient. Click the Delete button (Figure 3, F) to remove a person from this list.